Very interesting post about what went wrong with the Star Wars prequels that’s worth a read for writers and GMs. It boils down to a pretty simple point – if you start with a simple plot, it allows for the characters and story to grow more complex in the telling, but if you start with an overly complex plot, then you’ve pretty much put a block on those things. I’ve always subscribed to the idea that your players should be the most interesting characters in your game, and this advice applies to them as well. Starting from a simple plot creates an opportunity for your game to grow in directions that reflect you and your players. This is usually easiest if you start from the goal, since that tends to suggest the previous steps. With that in mind, I strongly suggest a concrete goal – “power” (or even “profit”) tend to be so amorphous as goals that they don’t really suggest a course of action. If a goal of that sort is what you’re looking for, then try to pick some manner of specific implementation of it, like leveling up or stealing a particular treasure. This process is made much simpler if you embrace the cheese. There is a natural inclination to try to make the plots smart, coherent or clever, but realize that a lot of great plots have almost embarrassingly simple underpants structure. Y’know – Take Ring, Throw it in a Volcano, Free Middle Earth. Look at that example and consider how far short of the true complexity of the story that falls – the good parts lie in that difference. The trick is that you don’t need to solve all of the problems up front. 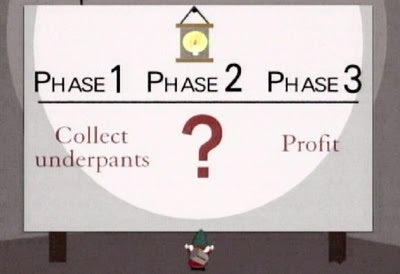 The underpants plan should seem unworkable on the face of it because it leaves unanswered questions. Answering those questions is a driver of play. This entry was posted in Techniques on June 14, 2011 by Rob Donoghue. @Paul I definitely support that approach as a player. As a GM, I flip it. You can do that in a pinch (Since it’s ultimately a guy bursting into the room with a gun) but that’s fallback. @senatorhatty The trick is that when someone creates a fiction, it tends to be very complete and coherent, not cracked and flawed like real life. To find good goals, you need to find the cracks – the inequalities, imperfections and shortcuts – and the people who are unhappy with their lot in the balanced, static world. However much your world makes sense, there must be those who reject that sense. Curiously, this echos back to Paul’s comment. A little disruption can reveal the world to you in ways you’d never expect. When you come up with the simple step, choose something that’s transgressive and alarming, but not something irredeemable. It’s that middle, complicated step that should be truly heinous and irredeemable and queasy-making. Great points and definitely the right way to build up a background. Only thing I’d add is the amount of crazy fun this provides once you start working with multiple “villains”. Quotes there because we’re not really talking about villains, we’re just talking about anyone not the PCs. My campaigns typically have more than a dozen NPCs who are all involved in various “plots” of their own — the fun REALLY comes when those start intersecting. All sorts of unpredicatable hilarity ensues, guaranteed. However, I think your example “Fain Undead Army” is just as bad as “Power”*. I have no more of an idea of what someone would want with an undead army than what they would use “power” for. And an undead army comes with problems like upkeep and stench. *Though I think “Profit” can be fine. Imagining what anyone would do with a lot of money is pretty easy. You don’t necessarily need to dig deeper. Although it’s not a bad thing to clarify if they want to buy a private island or a politician or eliminate poverty to humanize the villain even more. @EZ There is absolutely a “What next?” element to most step 3’s, but that’s part of the fruitful incompleteness in my mind. The difference between “Power” and “an undead army” is that I’m not really sure what form power will take, so the process becomes muddled. I’m vaguely uncomfortable being in any way hand-wavy, but it’s working so far. I do THIS EXACT thing. I have even referred to it as “The Underpants Gnomes School of Villainy.” Leaving the middle somewhat blank is a critical part of the design, because it allows the bad guy/adventure to react to what players do in the game, so that they reach a satisfying conclusion the players can steer. Great post, and it’s simple advice but I’ve seen people (myself included admittedly) trying to create complicated storylines and having to use far too many NPCs, which nobody usually cares about. @Joe: You’ve just defined every Final Fantasy villain there is, I think. The “what next?” after step 3 is the step 1 of the next adventure.